“I truly enjoy hundreds of mosquitos using my front yard as a breeding ground” — no one, ever. Why begin with a random quote about mosquitos in today’s blog post? Well, for one, jokes about mosquitos are easy, low-hanging fruit. No one likes mosquitos. Additionally, when your yard becomes too saturated with rainwater or even runoff from your sprinkler system, it could very well turn into a swampy, mosquito-ridden mess. You don’t deserve to endure multiple mosquito bites just to make it from the driveway to your front door, and you don’t deserve a puddly mess of a front yard. Fortunately, A & C Sprinkler offers simple and effective yard drainage solutions in Toms River. No one buys a home with quality landscaping just to see it fall apart and soak up with water. 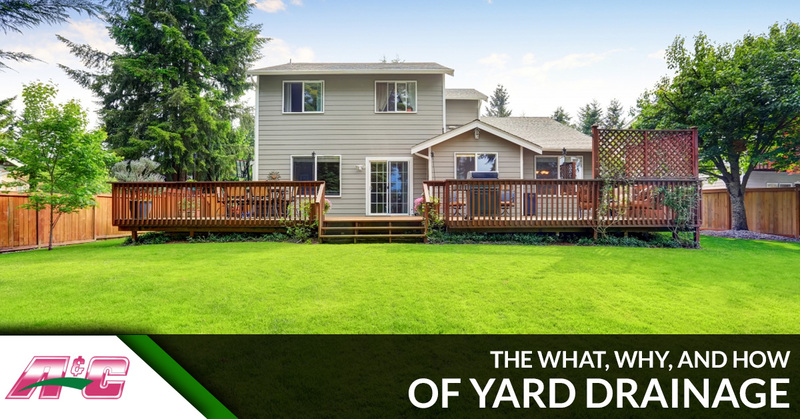 Your grass is a feature of your home’s exterior that you should reflect on with pride. It looks good, adds property value, and provides a safe and soft place for the kids to play during those summer cookouts out on the patio (grass allergies notwithstanding). Why let unwanted water or soggy soil ruin a perfectly good backyard adventure? The reality with yard drainage is that you don’t really think about it until it becomes a problem. After all, we’re all incredibly busy with our lives, especially homeowners with jobs, kids, social lives, and countless other matters to attend to. Who has the time to tackle yard drainage on their own? Let A & C Sprinkler do all of the heavy lifting for you and your family. From our Top Rated Local® stormwater management services to everyday sprinkler repair and sprinkler blowouts to help you prepare for the colder seasons, we’re always here to help your yard look great no matter what time of year it is. Get a Speedy Fast® quote today to learn more! Standing water isn’t just unpleasant to…stand in. It looks bad up close and from afar, and as we cheekily touched on up above, standing water really does invite a host of insects and mosquitos to make your grass their new swamp of choice. Who could blame them? With several inches of pooled up water soaked in and on top of your grass, it’s the ideal environment. So, not only are you subjecting you and your family to a number of bug bites and mosquito bites, but you’re also damaging your grass — in some cases, irreparably so. In turn, you’re damaging the value of your home as well as a fun play area for your kids to enjoy and one of the primary aesthetic qualities of landscaping. Don’t get us started on pooled up ground water slowly but surely flooding into your basement…that’s a nightmare of its own that we won’t be able to help you with. That’s a great question; we’re thrilled that you asked. Standing water usually occurs after abnormally intense and heavy rainfall such as a major storm or a period of extended torrential downpour. It’s natural for your yard to soak up a lot of the water that falls from the sky and temporarily pool up, but after a few hours, this standing water should naturally absorb into your grass or slowly divert away to nearby street drains. If there’s any reason to be envious of your neighbors, it’s because they have a well-draining property (that is, in the context of this blog post!). A well-draining property should slope gently and gradually toward the street and away from the house. Typically, this slope descends about six inches over the ten feet or so that surround a home’s foundation. Another foot or so of sloping should occur over the next 100 feet. Perhaps the curvature of your property was ideal when your home was originally constructed, but the ground beneath you has since shifted. That’s when you call the team at A & C Sprinkler. Standing water is bad news for you, your family, and other life forms that aren’t evil, unlike mosquitos. A quick call to A & C Sprinkler will land you a consultation visit and from there we will present you with realistic and affordable yard drainage solutions. It’s that simple on your end — contact us today to get started!